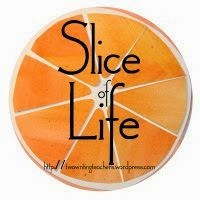 I'm slicing with the Two Writing Teachers community for Day Nineteen of Thirty-One of the Slice of Life Challenge in March. Thank you Stacey, Tara, Anna, Betsy, Dana, Kathleen, Beth, and Deb. It is my habit to look at the good things always, finding the brightest moments in each day. This week my son and daughter-in-law came in for a visit during their son's spring break. He was off to Orlando with his high school band. I had a wonderful time with them, and wrote about it in my post last Thursday. On that day, they all went skiing while I did my job at the bookstore. Nathan and Barb wanted to see their nieces' skiing progress and have a good day skiing all together. It didn't turn out so well. Trying to catch the youngest, Imogene, who was going too fast, my daughter fell and broke her leg. It's hard, and will make changes in their lifestyle for a couple of months. She still hasn't seen the orthopedic surgeon to find out the next steps, waiting for the swelling to go down. I will help all I can of course, but am sorry for it happening. So, can I turn this into a celebration? Yes! It could have been much worse. It's a simple break, and we're all hoping she'll be healed soon. I am grateful that my son and daughter-in-law were there. My daughter and the girls have been skiing alone these past weeks, so it wouldn't have been so great for it to happen one of those times. And, from what they all told, everyone on the mountain, in the resort's emergency place, and later in the urgent care in Denver were wonderful. Having caring people help in this instance is like a big hug. Thursday into Friday, lots of snow, which we need very much. I said goodbye to my son and daughter-in-law, bittersweet, but I am grateful they come so often. And I had Ingrid afternoon into evening. Part of our time held ice cream of course, but also groceries for her family to help them out. It is a joy to be with a six year old at a grocery, with her eyes asking questions about certain things, choosing just the right things she knew that her family liked. David Harrison, poet, posts a word of the month on his blog for adults to write from. If you're interested, the link is here. He also accepts student work on another page. Check it out! This month's word is "slush". My glass is always "half-full". Good job turning a dangerous and difficult moment into a positive outcome. Skiing scares me. I worry about running into a tree. And that is a worry, but skiing has been in their lives a long time without problems. It just takes one "funny" turn, though. Thanks, Glenda. Thanks, Carrie, what a week it has been! So sorry for your daughter's injury, but what a blessing that her brother and his wife was there to help getting her and the girls back to Denver. Yes, life is better when we look at it with the glass half full. Busy days ahead for you as you help fill in the gap left by the broken leg. Yes, agreed to all, Elsie. We were all so so glad that she had help. The girls did great taking it all in about their mom, but it was alarming to them nonetheless. Thanks! I am so sorry for your daughter. I know it was frightening for one and all. Your optimism helps everyone. I hope little Imogene doesn't feel responsible. I don't think Imi is even aware that her 'flying' made it happen, Maureen. None of us have said much about it in front of her. Thank you. Hoping and praying your daughter will mend quickly. Thankful that your son & daughter-in-law were there to assist. I'm sure your granddaughter were distraught about their mother, but were comforted by all concerned. Both the girls were upset, but Ingrid at almost seven is a "helper" and was already planning what she would do to make things easier. I imagine a routine will help them know that some things will be different, but not all. Thanks, Judy. Sorry for your daughter's leg. Such a complicated situation with two little children. Wishing fast recovery. Thanks, Terje. Time marches on I guess. I hope too for a quick healing. "Puddle-ready"--love! And it is a choice we make for our glasses to be half-full. I feel for your daughter--so difficult to manage an injury like that with small children and so many responsibilities. How grateful she must be for you! 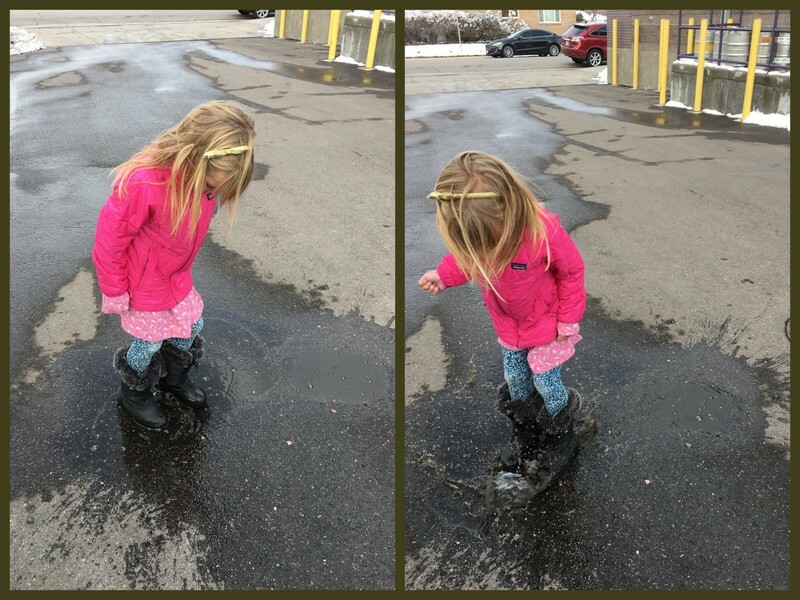 Thank you, Elisabeth, the puddle splashing with Ingrid did my heart good yesterday. We'll see how it all works out with my daughter & the family. The girls are quite self-sufficient, so that's good. I really like your attitude, Linda. If we look there is always something good that comes out of something bad. Glad you had this time with your family. I am so glad, too, just wish it had ended differently. Thank you. You and elsie had similar posts today, finding the good in what many people would think is not-so-good! But the pictures and poem at the end were the best part -- such a sweet treat! Thanks, Jennifer, you're right. I'm glad that she and her mom got good news. How wonderful Linda that you look for the glass half full all the time! I too try not to complain, and see my glass the same, but I admit I'm not always successful. Good luck to your daughter. Thanks, Lynn, I'm glad to know you feel the same. And yes, I don't always feel successful either. How awful for your daughter - hope she is better. It is much better to look at the bright side - sounds like so many helped her. Take care. Thanks, Beverley. She still needs to see the orthopedist, but with some meds, felt a little better today. Sorry to hear about the break! Thank goodness all were around to help. I love the poem and connecting with the trip to the grocery Linda! Hope all goes well with the healing process. Thanks, Amy, will just have to take it a day at a time. Sorry to hear about your daughter's accident. But definitely good that she was not alone with her girls when it happened. Hopefully she will see the orthopedist and be on the road to recovery in no time! It will be good to hear what the doctor thinks for sure. Thanks Carol. What a blessing for your daughter to have you close by. So happy she wasn't alone with the girls when this happened. Ingrid will be a big help, I'm sure! Take care. Thanks, Kendra, yes, Ingrid can do a lot to help. We were so thankful that my son and daughter-in-law were there too!